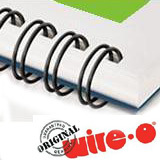 Wire binding elements for all machines utilizing the Wire-O® 3:1 pitch with 32 loops. 100 elements/box. Wire binding elements for all machines utilizing the Wire-O® 2:1 pitch with 21 loops. 100 elements/box.